Các 8508A là một thiết bị đo có độ chính xác đến 8,5 số được thiết kế đặc biệt cho đo lường. Với độ chính xác cao và ổn định qua một loạt các phép đo 8508A được thiết kế như một công cụ đo lường đa năng chính xác cho các phòng thí nghiệm hiệu chuẩn phải đáp ứng yêu cầu đo và phân tích ngày càng nghiêm ngặt tuân thủ yêu cầu tiêu chuẩn ISO 17025. With the introduction of the 8508A, Fluke Calibration has created a new product category – the reference multimeter – specifically for metrology applications. The 8508A Reference Multimeter draws upon decades of Fluke Calibration expertise coupled with our acquisition of Wavetek-Datron to deliver unmatched accuracy and stability; functionality and versatility; and ease of use. The 8508A features 8.5 digit resolution, exceptional linearity and extraordinarily low noise and stability, producing what are arguably the most accurate measurements to be had from any commercially available product today. But that’s only part of the story. Measurements must be repeatable today, tomorrow, next week, even next year. That’s why stability must be treated with the same priority as accuracy. The 8508A demonstrates 365 day stability as low as 2.7 ppm, with a 24 hour stability of 0.5 ppm, ensuring that confidence in today’s measurement can be the same as it was yesterday or last year. Metrologists need to make many diverse measurements as part of their complex duties. To achieve this frequently requires a complex array of instruments. The 8508A provides an extraordinarily broad range of measurement capability. This means you can undertake a wider range of applications, and perform most of your measurement requirements with a single instrument, providing real economies in time and money. Human error and misunderstanding of measurement setups often have severe impact on measurement accuracy. Such errors are often due to impenetrable or complex user interfaces and lack of user familiarity. The 8508A’s clear control structure with Dual ParamatrixTM displays and context sensitive menus provides a transparent, logical and intuitive mechanism with which to interact with the instrument. Consistent with the philosophy of designing a product specifically for metrologists, the command and menu configuration is constructed to ensure rapid, error free access to complex measurement setups. It means that you can focus on getting the best possible results, without needing complex sequential or multi-instrument setups, or the need to perform complex mental arithmetic or math to achieve the desired result. With DC and AC ranges from 200 mV to 1 kV, the 8508A covers all your voltage measurement needs. Full 8.5 digit resolution is available on all ranges to provide resolution down to 1 nV. Bandwidth for AC measurements extends to 1 MHz. Excellent linearity, coupled with Ratio measurement capability, means that the 8508A can replace Kelvin Varley dividers and AC/DC voltage transfer standards, improving your measurement efficiency in one simple, single box solution. The 8508A features a remarkable new current measurement system. For the first time, resistance at the input is virtually zero. This means that measurements can be much less invasive, and present virtually zero burden to the measurement points. It also offers the advantage that complex guarding schemes are now largely unnecessary, and measurements can be made more reliably, more repeatably and with greater confidence. Ranges from 200 µA to 20 A and frequencies from 1 Hz to 100 kHz, again ensure that all of your measurement needs are covered including the high currents encountered when calibrating multi-function calibrators. With ranges from 2 Ω to 20 GΩ and resolution as low as 10 nΩ, the 8508A can truly be described as the ultimate resistance measurement system. Add to that a high compliance of 200 V and a high measurement current of 100 mA, and you can begin to understand how the 8508A can help extend the range of your resistance measurements. But performance of the resistance measurement system doesn’t end with just specifications. Attention to measurement technique helps further improve your results. For example, when making ratio measurements, the same current is forced through both resistances, and only the measurement is switched. 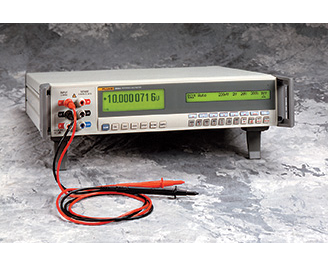 Measurement current is reversible to eliminate errors due to thermal effects. To further extend your range of measurements, the 8508A offers temperature measurement through 2, 3, or 4-wire PRT’s or SPRT’s, with a temperature range from -200 ºC to 660 ºC. With simultaneous temperature and resistance readout, ITS-90 and Callendar van Dusen Linearization’s the 8508A is an ideal tool for both temperature measurement and PRT calibration applications. As with resistance, current reversal is used to remove thermal emf errors. This greater flexibility provides the means to increase the overall range of your scope of precision measurements, and to realize better uncertainty on many of the measurements you might already perform with less than ideal equipment. As well as conventional front input terminals, the 8508A can optionally be equipped with a duplicate set of rear input terminals. This can be invaluable in making ratio measurements, which are available on both voltage and resistance functions. They also provide the mechanism for forcing the same current through two resistances to improve resistance ratio measurements.